Recognized and supported by the current International Liaison Committee on Resuscitation (ILCOR), T-Piece resuscitation has become a popular method of neonatal resuscitation in both Labor & Delivery and NICU settings. While other systems are often difficult to set and operate, our PIP safety valve is easily activated using only one hand by simply pressing the PIP Knob Release. The advanced ergonomic T-Piece design facilitates comfortable hand positioning and allows you to control the breath with one hand. Using the integrated blender, control O2 levels, and PIP and PEEP throughout the resuscitation process helps ensure adequate oxygenation. 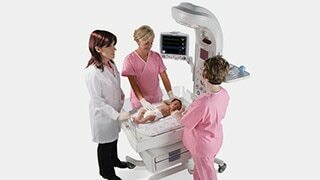 Designed to meet the needs of the NICU patient and clinician.